I've been slowly working through my slide collection making scans of just about everything. I'll take a stack of slides, load them into the scanner stack loader, make the scans, and then import them into Lightroom. Since I'm not really looking at the slides I'm going to scan as I load them in the scanner, when they open in Lightroom it's like the good old days of opening a fresh box of slides to see what's in them. I'm often surprised at what comes out of the scanner! Such was the case when I loaded up the slides from October 1990. 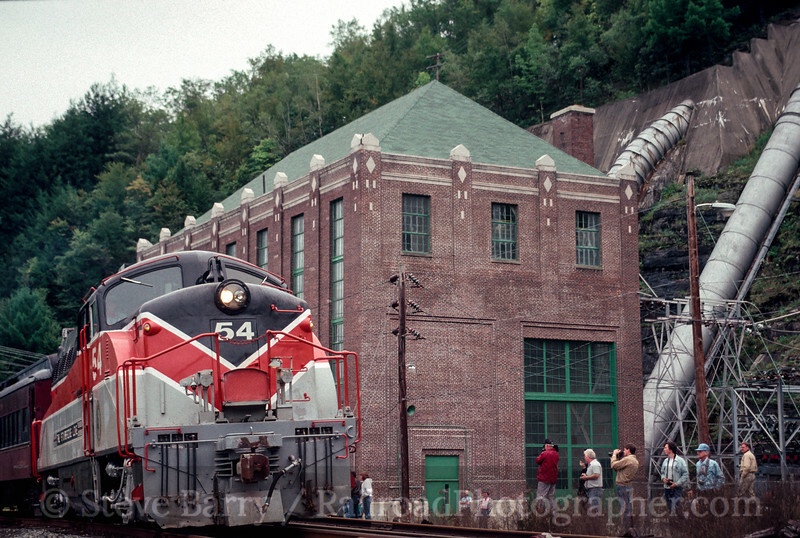 When the images opened in Lightroom I found a trip that I had taken to the Monongahela Railway back when that was the place to go for photography. The weather was bad for part of the trip, and to compound matters I managed to blow the exposures on some of the best scenes from the trip. Thus, the slides sat unlooked at and unappreciated for 20 years. But with Photoshop and Lightroom, slides that were rendered useless can yield very nice images. 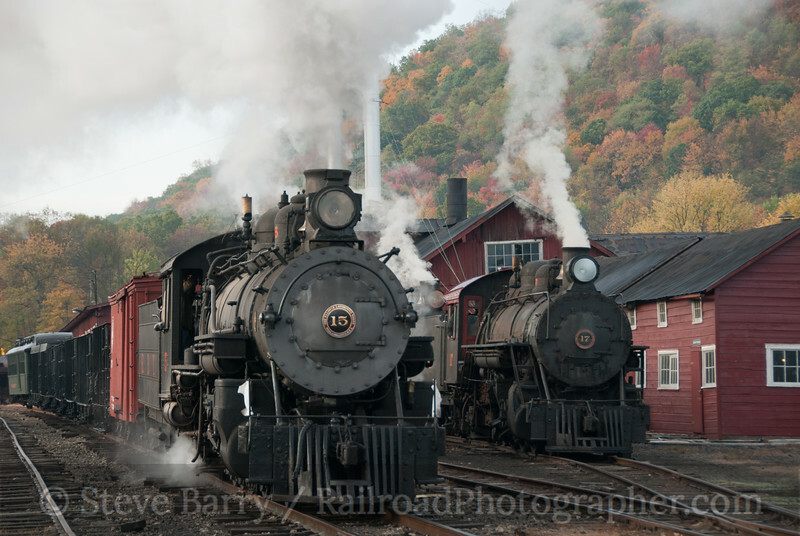 My favorite from the trip was of a pair of Detroit Edison GE diesels leading a train at Time, Pennsylvania. I had over-exposed the original, but thanks to modern technology I've managed to save this photo (above). 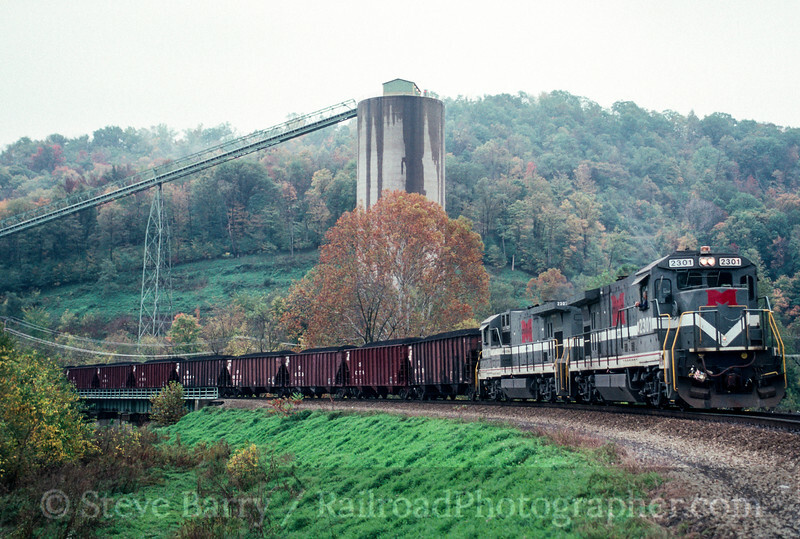 The rain made for some dark photography on the first day, but some brightening in Photoshop put the Monongahela's "Super 7" GE diesels back into good light, such as this scene of a train heading out of Waynesburg. There were a few other gems located in the October 1990 stack. The town of Nicholson, Pennsylvania, had a large event, complete with a parade, to celebrate the 75th anniversary of the Delaware, Lackawanna & Western's magnificent bridge over Tunkhannock Creek and the town. 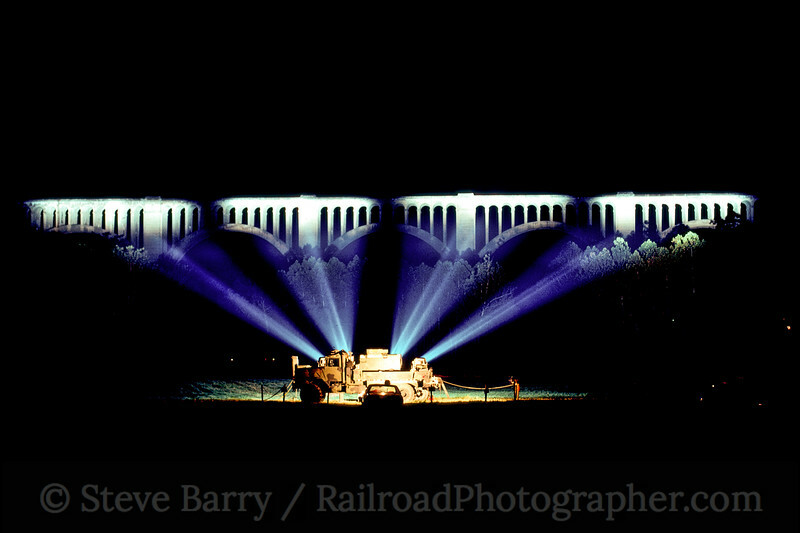 That night the bridge was illuminated by a searchlight truck. The black & white photos I took that evening were pretty good (one appeared in the NRHS Bulletin), but I was never happy with the color slides. But thanks to scanning technology, the color version is now usable. There was still more hidden gems in that stack of slides. A bunch of us did an informal night photo session at the shops of the New York, Susquehanna & Western in Little Ferry, New Jersey. One of the scenes from that evening is among my all-time favorites, but there was a second scene I had almost forgotten about. There was a front-end loader parked near GP18 No. 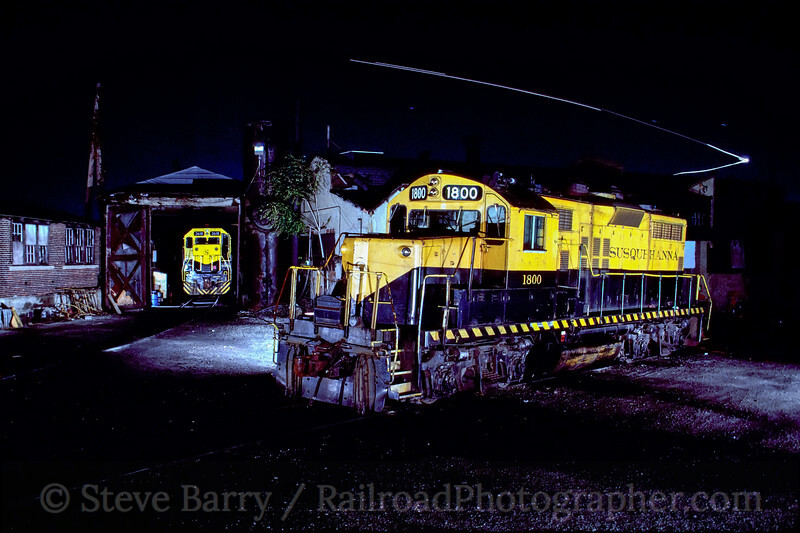 1800, and four of us carefully stacked ourselves, cameras and tripods onto the hood of the loader to get a nice scene of the 1800 with another locomotive tucked away in the shop. 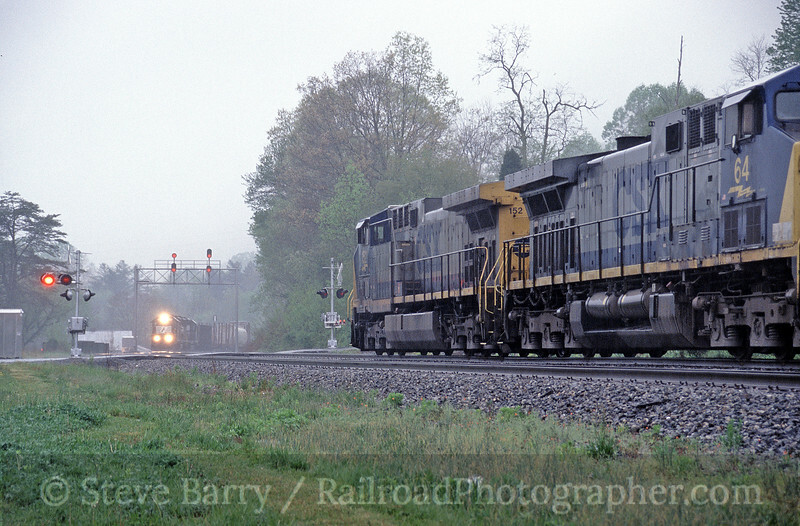 And finally, it's been my goal recently to get the Stourbridge Line's BL2 diesel passing the PP&L power house in Hawley, Pennsylvania. I knew I had shot a fan trip there many years ago, but forgot exactly when. Well, guess what showed up in this stack of slides. Yup, the trip was just over 20 years ago, in October 1990. It's great to go down memory lane with a stack of old slides made new through modern technology! Christmas has always been a special time for railroad enthusiasts -- how many railfans got their start with a Lionel set under the tree? Trains and Christmas just go together. The Polar Express movie from a few years ago only reinforced the Christmas and trains connection. 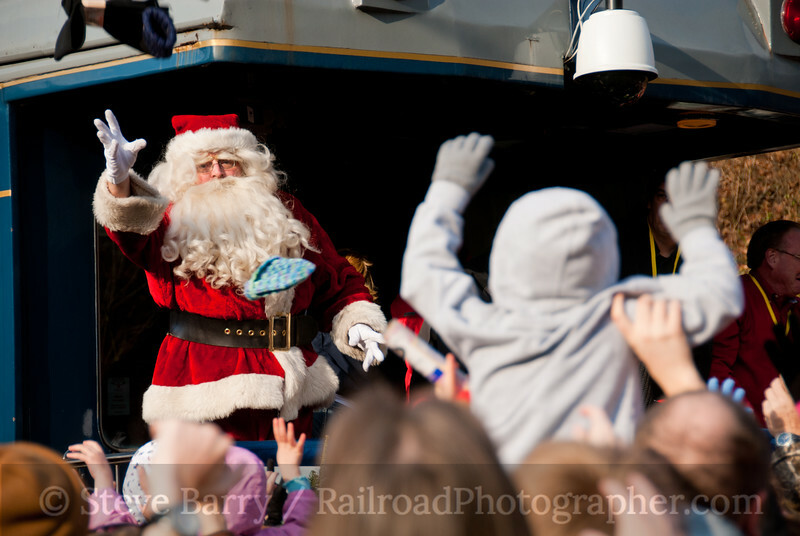 Many tourist railroads offer official Polar Express trips or knock-offs (North Pole Express is one way to avoid copyright issues!). And a lot of this magic can be found at night, when the trains and the surrounding communities are decorated in lights. Thus, in addition to being a time for peace on Earth and goodwill towards men, it's also a good time to break out the strobes for some good ol' night photography. On December 10, 2010, I headed down to the New Hope & Ivyland at New Hope, Pennsylvania. Just outside of town is a location called Hood, with a nice bridge over a small stream. 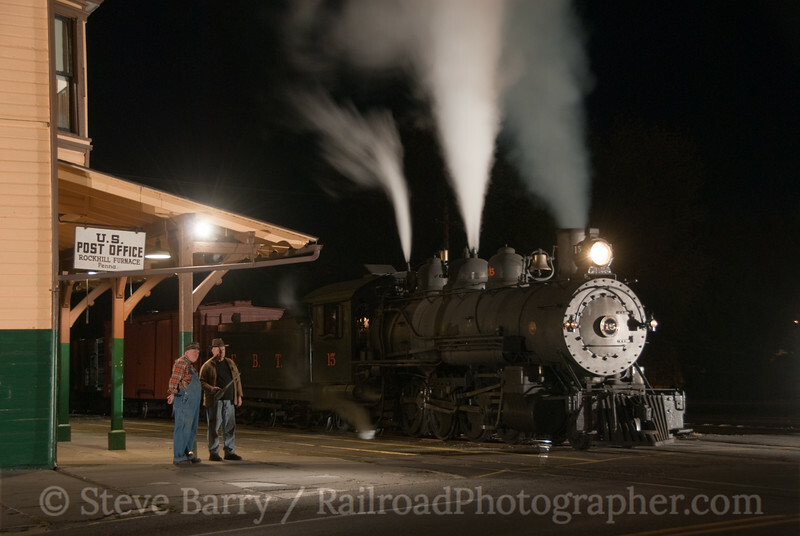 Santa was riding the NH&I throughout the day, but on Fridays and Saturdays there were three departures after dark. I met up with Mike Burkhart and Jeff Smith at Hood, and each of us set up a set of lights to capture the Santa Claus specials. With two flashes each, it was quite the light show each time 2-8-0 No. 40 steamed by. We stayed at Hood for three hours, trying different angles with each departure. It was a cold, but fun, night. The next night the three of us were onboard the Christmas Lights Streetcar Special hosted by the Wilmington Chapter of the National Railway Historical Society. Mike is the Chapter president and assisted with moving lights around, while Jeff and I used over-the-shoulder Lumedyne flash units to light a PCC-2 streetcar on the streets of Philadelphia. 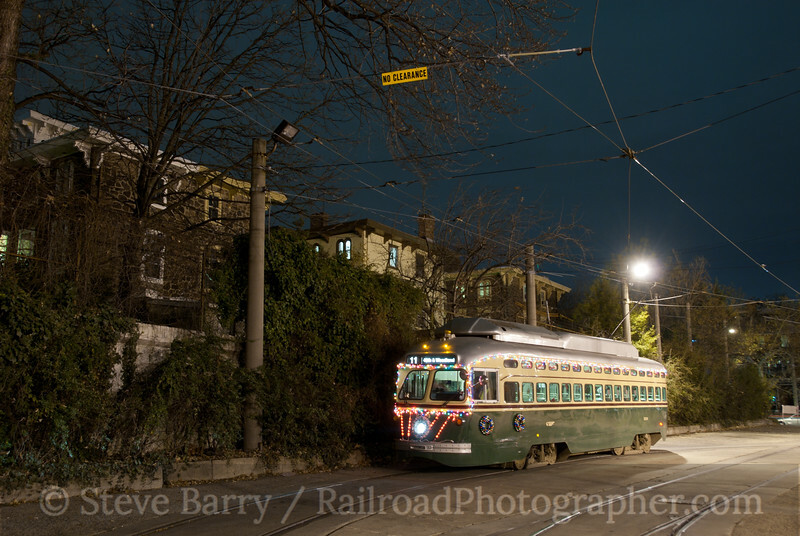 SEPTA personnel (consisting of streetcar operator Gary Mason and supervisor Ed Springer) were cooperative in allowing several night photos; locations were picked based on the amount of Christmas lights along the street or, in some cases, because a street was quiet of auto and other streetcar traffic. 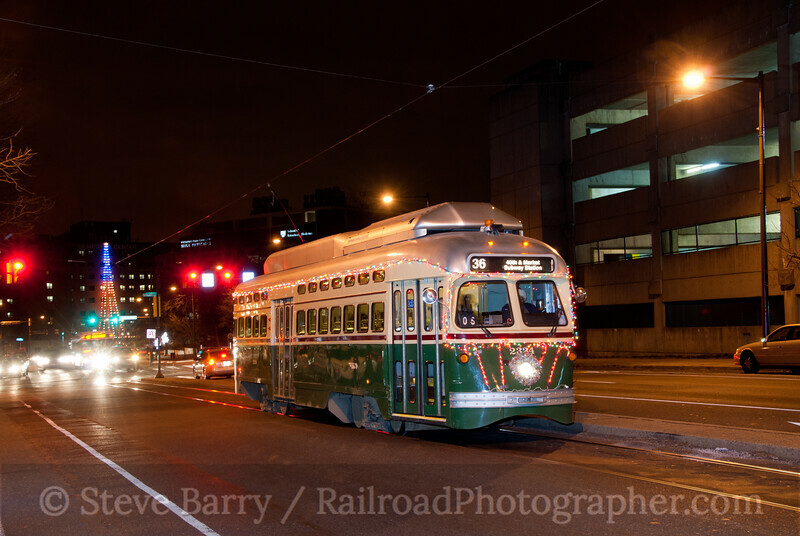 No Santa tonight, but it was an unusual streetcar opportunity. 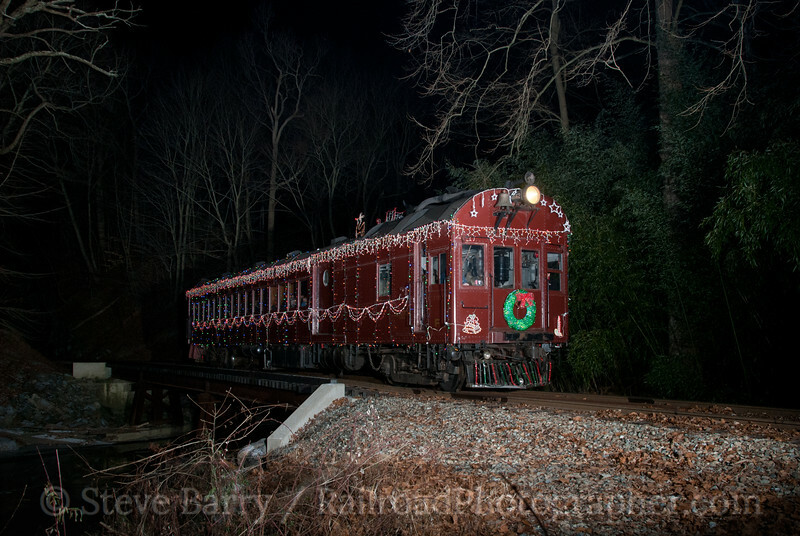 A week later (December 19) Mike and I were in Delaware along the Wilmington & Western, where their Pennsylvania Railroad "doodlebug" (a self-propelled diesel-powered railcar) had its halls decked with many, many Christmas lights. 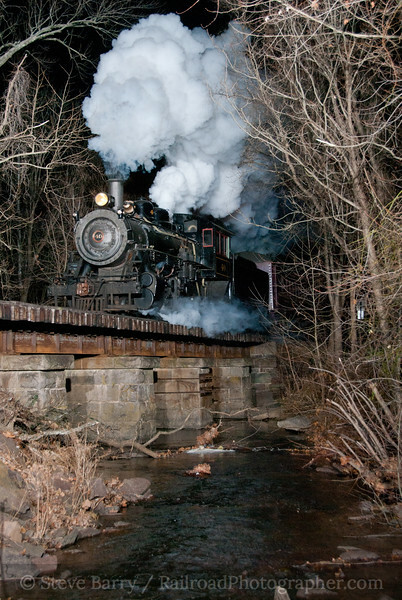 We went to the small community of Wooddale, location of one of many bridges across Red Clay Creek, to photograph four after-dark trips on the railroad. Steve Jensen, a volunteer for the W&W, was out chasing as well, and he arranged for the railcar to traverse the bridge slowly on each trip, allowing us to fire off several shots each trip. Finally, the last trip ran and it was time to head home. Now I really have the Christmas Spirit! More photos from each of these trips can be found in Photo Lines. 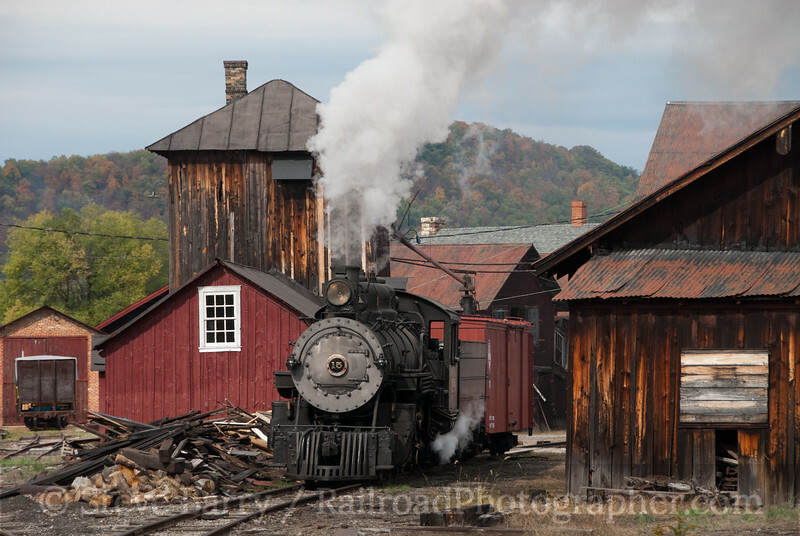 Back in October I participated in a photo charter on the East Broad Top Railroad in Rockhill Furnace, Pa., hosted by Lerro Productions. The EBT is the last narrow gauge railroad still operating in its original location east of the Mississippi River (although Maine's Wiscasset, Waterville & Farmington now has tracks on the old right-of-way after decades of abandonment). 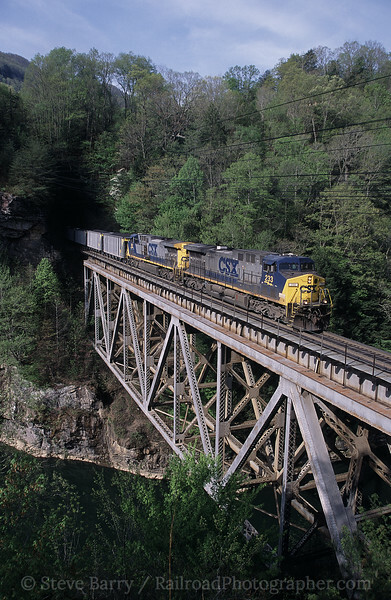 The EBT has five miles of track, much of which parallels busy U.S. Highway 522. Back yards and businesses have encroached on much of the EBT, especially immediately north of Orbisonia. 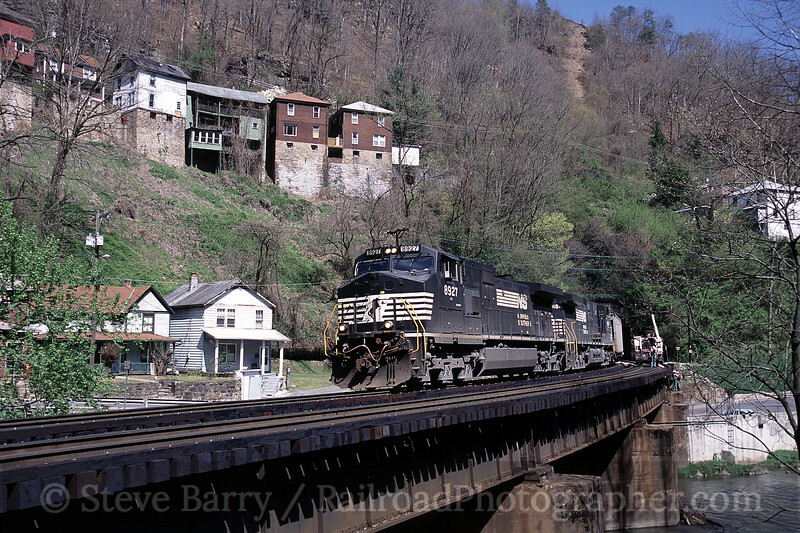 Pete Lerro of Lerro Productions decided to focus the charter on the EBT's true treasure -- the nearly intact shop complex in Rockhill Furnace; the EBT station is there as well, although it bears the name of Orbisonia, the larger town across Blacklog Creek from Rockhill. The roundhouse, sand house, coal tipple and water plug all make the shop complex a trip back in time. EBT has six 2-8-2s on the property in three sizes -- No. 12 is the smallest, with Nos. 14 and 15 in the medium size range and Nos. 16, 17 and 18 the workhorses of the old coal hauler. Currently only No. 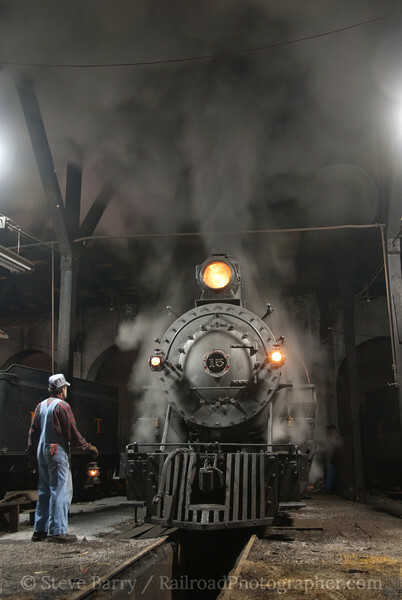 15 operates, while the rest sleep in the Rockhill roundhouse. Pete arranged for Nos. 16 and 17 to be brought outside the roundhouse for the charter, and through some pyrotechnics the two dead locomotives had some life brought to them. 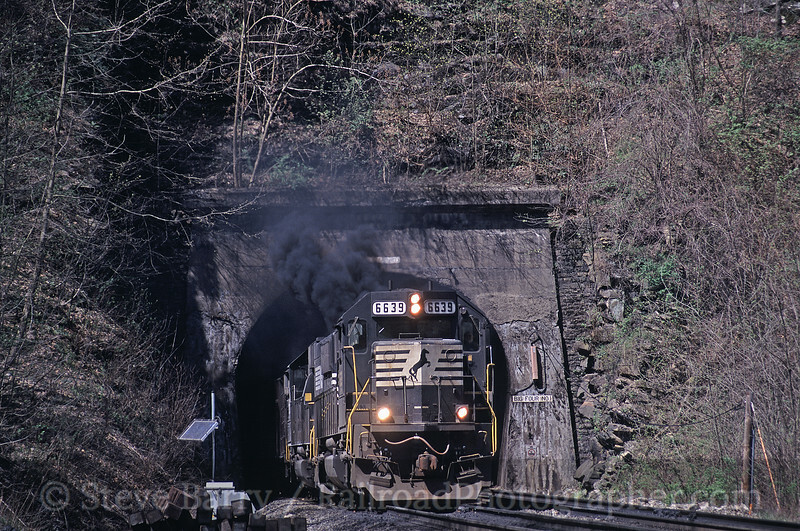 East Broad Top 15 passes 17 and 16 in the yard at Rockhill Furnace, Pa. The previous evening, an elaborate night photo session was held at the Orbisonia station, with No. 15 posing by the depot. Lerro Productions used fix lighting to allow photographers to capture many different angles over the course of a couple of hours. The evening wrapped up with some classic scenes inside the roundhouse as No. 15 was put to bed. Thanks to the staff of the East Broad Top and Lerro Productions for a journey back in time. More photos from this event can be found in this section of Photo Lines on the website. 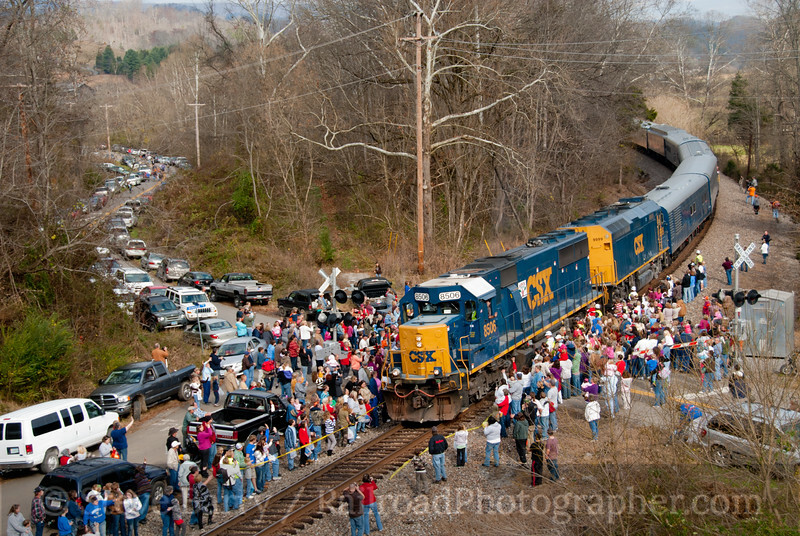 On November 20, 2010, brother Bruce and I chased the 68th running of the Santa Train on the Clinchfield Railroad (now a part of CSX) in southwest Virginia. The last time I chased this train was 18 years ago, on the 50th Anniversary, when Union Pacific sent their Challenger No. 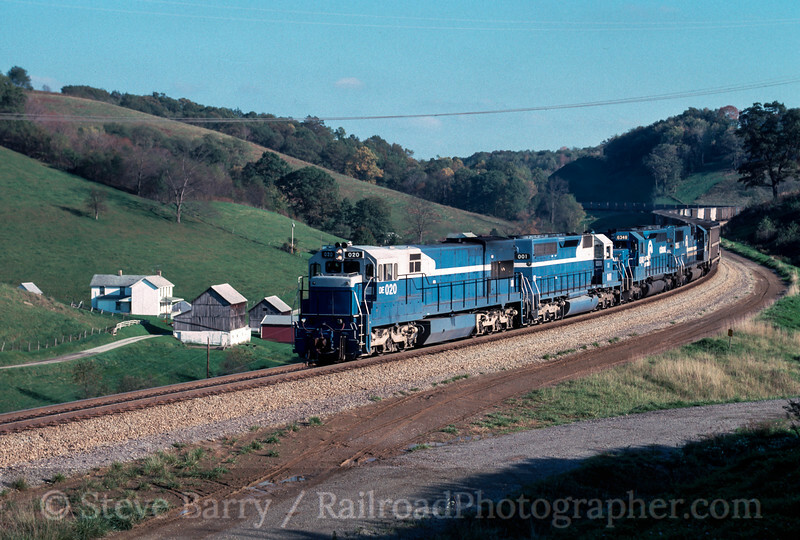 3985 to run in disguise as Clinchfield No. 676. 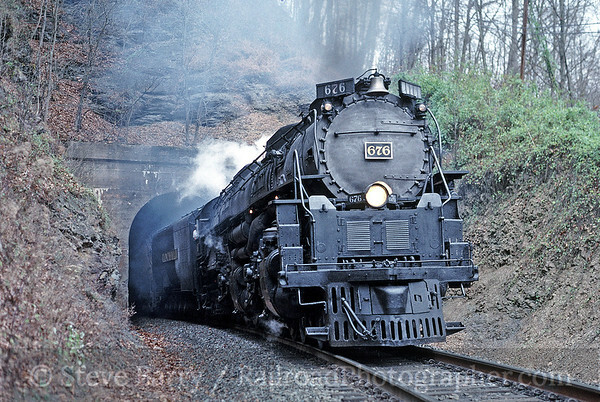 On that day in 1992 we spent most of the time photographing the head end -- the steam locomotive. But the real story of the Santa Train occurs at the rear, where the Jolly Old Elf tosses off tons of toys and goodies to the people of Appalachia. This year Santa had two helpers, mother-and-daughter singing duo Wynonna and Naomi Judd. Bruce and I first went into Haysi to photograph the stop there as swarms of people gathered to see Santa. Down the line at Clinchco the crowds got larger. We bypassed a couple of stops to get some head-end shots of the train on the road, but returned to the rear during the busiest stop in St. Paul. Here there were hundreds of people ready to see Santa and the Judds. And as Santa tossed off toys, I just happened to be at the right spot when a little girl smiled as she held her new stuffed bear. 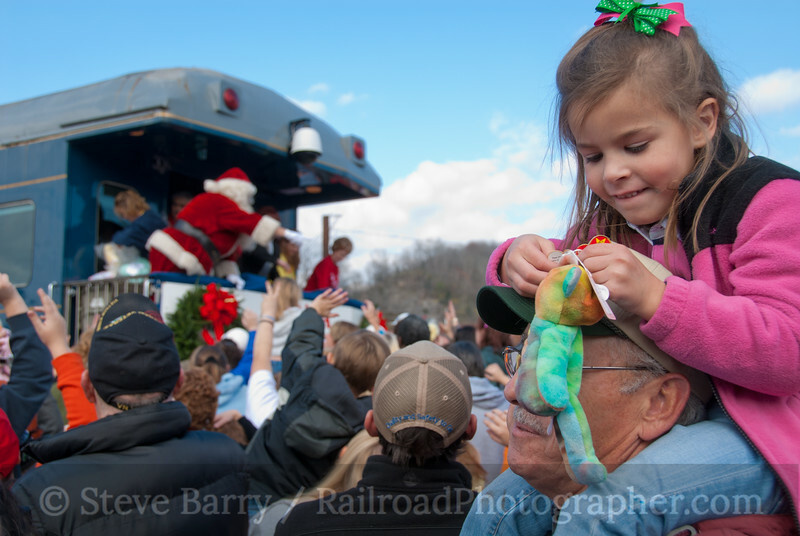 The Santa Train isn't about passenger locomotives and steel -- it's about a little girl's smile.